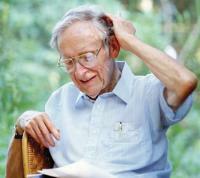 Jesslyn Shields recounts meeting Dr. Eugene P. Odum, known as the "Father of Modern Ecology." Ms. Shields now lives in Athens, Georgia, where she serves as watershed support coordinator for the Georgia River Network. The Father of Modern Ecology drove a white Ford Taurus. He owned two of them: identical but for the wear. The one he picked me up in the day we met was "the grocery-getter," and he handled it as if its last trip to the supermarket was quickly approaching. The other, he explained, was driven exclusively on the highway, for trips of 100 miles or more: to Atlanta and back, for instance. "That's very scientific," I said from the passenger's seat, and regarded the consequent silence nervously, watching the bare limbs of February trees pass over the windshield. I met Dr. Odum in 2001, when he was 88 and a half. I had done some reading beforehand, or tried to. I checked a book out of the library: Fundamentals of Ecology, by Eugene Pleasants Odum, a yellow, coffee-stained volume emblazoned with the sort of geometric emblem favored in the 1960s. I leafed through it the night before our meeting and woke up the next morning with my face lying in a figure entitled "A Compartment Model of Biomass Change in a Grassland Ecosystem." As I lifted my head from the book, I was confronted with a mathematical equation, stark and meandering on the page: triangles, fractions whose primary participants were, to my knowledge, members of the alphabet, a symbol I vaguely recognized as Pi. That book I used as a pillow was the first ecology text ever written. In it, the idea of the ecosystem was pioneered; because of it, the concept of ecology gained popularity with the scientific community and the public with astonishing swiftness; and through it and various other publications and international awards, Eugene Odum became something of a legend. I was without a background in the sciences, but also without a job, the winter after I graduated from college. The former problem proved to be less of an obstacle to being considered for employment in a scientific field than one might expect. I knew someone at the Institute of Ecology at the University of Georgia whose compassion for my condition led him to suggest me for the job of caretaker of Dr. Odum's property in Ila, a little town just north of Athens. This friend called me on a rainy morning. "What would you think of managing a little research station for the Institute's old director?" he asked. "The rent's free and all you would have to do is open and close a gate when scientists drop by." I had just moved into my parents' house after five years of college in a faraway state. It was morning, and my father was in the kitchen blowing his nose and listening to the robot in the weather radio: "Mostly. Cloudy. In. Dah-loon-ee-gah. Temperature. Thirty. Five. Degrees." I sat on the edge of the bed in the guest room with the phone to my ear and stared at my shoe collection. I noticed it had been neatly lined against the wall. "I would certainly consider it," I said. "Great! How much do you know about Ecology?" I made an uncertain noise. "I dunno… a little?" "He pretty much invented it. Get his book. He'll pick you up at 11:30 Tuesday. And he likes to eat in the cafeteria - he's very old." On the appointed day, I watched from the window as the white Taurus eased up the driveway and Eugene Odum levered himself out of the driver's seat. As he made his way around the car, I first noticed that he was a small man, slightly built by any standard, but as I met him on the walk and shook his bent, purplish hand, I realized that although he was thin and almost debilitatingly hunched, he was unused to and impatient with his physical state. I heard later that he had once been an accomplished athlete - taller, stronger, more agile than he now was - and there were clues that these vanities had been grudgingly surrendered. There was a good-natured arrogance in his gaze and way of speaking, but he walked with a painful, deliberate spryness, and in his voice was pitched a battle: a great mind versus a tenacious waver. It was a strange effect: a bent little man, walking stiffly, as an old dog walks, always picking up his feet an inch higher than was comfortable, and constantly looking up sideways to catch me with pale, watery eyes and a pithy word of instruction. He told me that he was raised in Chapel Hill, North Carolina, as we drove (he in the driver's seat, I in the passenger's. My offer to drive had been flatly and almost scornfully refused). His father had been a professor of sociology at the University of North Carolina, and from a young age, Eugene was interested in birds. In junior high school, he and a friend wrote a naturalist's column called "Bird Life in Chapel Hill" that ran in a local newspaper. In his 20s, he studied zoology at the University of North Carolina for his Bachelors and Masters degrees and then went on to the University of Illinois for his doctorate. Ecology was a young science in the 1930s and only a handful of scientists at that time were working under the supposition that the ecosystem is the basic unit of nature, and biological diversity makes these systems work. This was the idea that compelled Eugene Odum, and Illinois was one of the only schools in the country that would allow him to take this sort of holistic approach to natural sciences. After taking a job at UGA as a zoology professor in 1940, Dr. Odum fought to make ecology a required class for biology majors. "When I was starting out at UGA, we were drawing up a curriculum of required courses for biology majors. I suggested ecology be required, and I was laughed out of the room. Later, colleagues started coming into my office wanting to know what this 'ecology' was!" In 1951, the Atomic Energy Commission accepted his proposal to monitor the Savannah River Site, a nuclear weapons plant in South Carolina, just across the Savannah River from Georgia. The AEC wanted to know whether the site affected the area's flora and fauna, and they gave Dr. Odum 300 square miles of property to create a laboratory, off-limits to the public and completely self-contained. The Savannah River Ecology Laboratory was set up, and research projects began, but if ecosystem ecology was to become a recognized science, something else was needed: a textbook. Dr. Odum and his brother Howard, who was at Yale getting his Ph.D. in zoology, began to set down the fundamentals of the science - not just for students and professors, but for everybody. It was first published in 1953, and for 10 years it was the only text in the field. Driving to a cafeteria on the UGA campus, Dr. Odum talked about his life. He was an active storyteller and spent long moments eyeing me for dramatic effect. I spent most of my time nodding and pressing hard on my imaginary passenger's brake pedal. "Let's say, you're an ornithologist, I'm a dendrologist and that gentleman there is a soil entomologist." He turned his head and gestured to the roadside where a team of orange-clad prisoners were collecting garbage. I glanced quickly, feeling sure he didn't notice the traffic light appear over the rise of the hill. I didn't know which gentleman he meant, but none of them looked particularly like the entomologists I knew. "You could study birds for a lifetime and really know something by the end. But you wouldn't know as much about a bird or its place in the ecosystem as you would if you had talked to us about what we knew." He thumbed at the backseat to indicate the entomologist we had left behind. "Organisms cooperate in an ecosystem the way humans cooperate in a community. What we need to do is concentrate on understanding natural systems. This planet is our supply depot, but it's also our home, and you wouldn't know that by the way we're acting, would you? " I nodded and then shook my head, lost for an answer and unsure of whether an answer was even expected. I will admit I felt a bit feeble buckled into the Taurus with the Father of Modern Ecology at the wheel, telling me how things were. There was something so different from, but not incommensurate with, others I should have been able to compare him to. As a result, I didn't know exactly how to act. He was old, of course, and I was very young, but I was used to being around elderly people: grandparents, neighbors, family friends. He was Southern, too, as was most of my family. In many ways, he was like the other Southern men: authoritative, polite, animated storytellers. He was talking, however, about a science I generally associated with long-haired professors in running shoes or environmental non-profit employees with Patagonia pro-deals. Winston Churchill once said something about a Conservative man under 30 having no heart, and a Liberal man over 30 having no brains. Dr. Odum was both the brainiest and most liberal 88-year-old I had ever met. I couldn't imagine him having a conversation with anyone even remotely like himself. Whether it was his ideas, his self-confidence or his frustration with the state of things that had allowed him to transform a few people's tiny idea into a movement, I don't know, but it was the same thing that separated him from everyone else. Consequently, I was a student to him - everybody was a student. Dr. Odum had been talking as we walked but stopped, mid-sentence, as we reached the trees. He bent back from his waist to survey the messy pine crowns and then hunched far over, dragging a foot through the grass, and chuckled grimly, shaking his head. "These don't belong here. This is just silly." In the cafeteria, he interviewed each of the diners about whose idea it was to plant longleaf pine and wiregrass between the Ecology and Forestry School parking lots. Nobody knew. He went on to explain that although there were a few stands of longleaf pine on the Georgia piedmont, the ecosystem in which longleaf and wiregrass were found together, and where their relationship with fire, wildlife, weather and a thousand other ingredients created a unique ecosystem was, in Georgia, found only on the coastal plain and not here in the northeastern piedmont. I was probably the only person at the table who didn't already know this, but the scientists nodded contemplatively. A graduate student - a tall man with a tic who studied rodent behavior - offered to investigate the misplaced plants. To this day, the trees, the grass, the interpretive sign remain in the fat wedge of ground between the lots. In the 1940s, Dr. Odum and his wife Martha, (who died of cancer in 1995), bought several hundred acres of land near Ila and named it Spring Hollow. There was a cabin where they and their two boys vacationed. They had chosen the property because it was its own watershed: dozens of springs surfaced on the hillside below the cabin and formed a small creek. "Nobody in 1942 was looking for a watershed!" We were driving to Spring Hollow from the cafeteria, and he turned his neck and grinned toothily at me from behind the steering wheel. "I told the man I wanted my own watershed, and explained the thing to him, and he said 'Yes sir, I think I know what you're getting at,' and he took us around - Martha and me - for months. We kept on looking at places - beautiful places - but none of them was its own watershed. I would say to him, 'Mr. Alewine this one's nice, but it's not a watershed,' and he would say, 'No, I reckon not, Dr. Odum, but I thought you would like to see it. It's got a creek on it, see?' When he finally showed us this one, and I said it would do, I thought Mr. Alewine was going to kiss me." We got out of the car in front of a gate blocking a road leading back into a dense wall of hickories. In addition to the watershed and the cabin in the woods, the Odum property included a dumpy yellow house close to the road, across the street from a line of chicken houses. From this house now issued a stream of dogs of all sizes and descriptions, followed by a fat, limping elderly man in coveralls and a NASCAR cap. We parked and hounds swarmed around the car, baying and heaving their heads and paws onto the hood, smearing their jowls on the windows. I opened the door a crack, and they jammed their noses into it, snuffling heavily and whining. Several of them were missing eyes, and the smallest was dragging a hind leg, limp as a pork chop. The old man approached the car too, waving his arms angrily and yelling the dogs off the car with a battery of lusty threats. He was a sturdy man with a rosy, pock-marked face, but his most remarkable physical feature was his left earlobe, which was dark red and not attached to his head, but hung from a thin piece of cartilage about halfway up his ear. As he hobbled through the pack of dogs to Dr. Odum's door, the earlobe twisted and bumped against his neck. "Hello, Mr. Donaldson." said Dr. Odum though the hullabaloo. "I see you've collected a few dogs." "Oh, these ain't my dogs, Mr. Odum," said Mr. Donaldson, as he teetered uneasily amidst the snouts and fur and teeth. "They was left here mostly. That little brown one's mine, but I can't take her to the senior's home with me. I figure she'll do for herself. They like bein' in the pack like that." Mr. Donaldson - "Champ," as he introduced himself to me - was going to live in a retirement home in Royston with his brother-in-law, "on account of my bum leg." Dr. Odum was trying to find a replacement for Champ Donaldson, and I was the first prospect. Champ's job was to live in the yellow house and make sure no one was driving down the dirt road to the cabin or building deer stands on the property. From the sounds of it, Champ was also supposed to be recording weather and temperature data, but his great, tangled eyebrows rose in genuine astonishment at Dr. Odum's inquiry into how this project was going: "No, I reckon I haven't been doing that 'tall, Mr. Odum." Once out of the car, with the swarm of dogs lured away by a truck passing on the road, we walked around the house, and I wondered if I would be a satisfactory replacement - or reclaimant - in the wake of Champ Donaldson's tenure as caretaker of Spring Hollow. I decided I wouldn't. There was a discussion about who would feed the dogs, who would clean up the pile of old tires behind the house, who would haul away the disintegrating carpet, plywood and asbestos shingles moldering under the house. The place stunk of chicken manure, the yard was spotted with dark, flame-shaped motor oil stains, and next to the water oak beside the house, several cans of latex paint lay rusted and leaking on the ground, victims of past target practice. As we surveyed the house and grounds, Dr. Odum became increasingly vexed, but Champ remained cheerful and ready to answer any question: that was his nephew's mess under the house, the neighbor's tires, he didn't know who dumped most of them dogs, but they would find somebody to feed them. Dr. Odum's smile became tight-lipped and his eyes hooded. He began to look tired as he shuffled through the house behind Champ's heavy limp, noticing burn marks on the walls near the gas heater and the hole in the kitchen floor, punched straight through to the red clay crawl space. As we left Champ and the house, the dogs sprinting down the gated road after the car, Dr. Odum turned to me and asked if I could read a mercury thermometer. I said I could. "Good. I want whoever runs this place to collect phenological data twice daily. There's a thermometer in the shed. And a clipboard." He retained that tight-lipped look, though now that he was out of the house - and away from Champ's cheerful, backslapping blamelessness - he seemed more irritable than overwhelmed. We got out of the car at the bottom of the road, where sat a log cabin with a wide front porch. We walked behind it into a quiet wood full of tall, naked hickories. He scuffed down the trail for a bit, gruffly pointing out groundpine, greenbriar and little brown jug as I followed, feeling a little tired and disgruntled myself. At the bottom of the hill, he stopped in the path, and I looked up from my shoes and over his hunched shoulder to see a group of 15 cardinals feeding on seeds in the trail: soft brown females and scarlet males, all with brilliant jewel-orange beaks. Some of them skipped into the air at our approach, but fluttered back to the ground when we backed up a bit. I decided that day that I didn't want the job at Spring Hollow, but for several weeks I kept in contact with Dr. Odum: he came to dinner at my grandmother's, I visited his house and he showed me his garden and gave me a book of Martha's paintings. I drove with him to the property to show a few scientists around who might be interested in setting up experiments. Champ Donaldson moved to Royston, but the dogs remained at Spring Hollow and grew very thin. On my last visit, the littlest one with the bum leg was missing. A few months later, I took a job at the Institute of Ecology as a field technician, and I saw a lot of Dr. Odum, though as time passed, he seemed not to recognize me when I said hello in the hallway. His was a corner office with glass walls, and I could see him in there most days, working at a small Apple computer monitor with a glowing green and black screen. He was working on the 6th edition of Fundamentals of Ecology. In the foyer of the building, there was a bust carved in his likeness with a brass plate affixed to its base: "The ecosystem is greater than the sum of its parts." He was something of a local celebrity - always in the newspapers and University publications, but I wondered if anyone in Athens knew what Eugene Odum meant when he said "the ecosystem is greater than the sum of its parts." I wasn't sure I knew exactly, but it felt good to say it, like an incantation or a Hail Mary. On a sweltering August afternoon in 2002, I met Dr. Odum in the copy room, greeted him a little vaguely, and took a seat on the paperclip table. He was wearing a pair of shorts and the air of intractable purpose he assumed whenever he conducted business around the office. As I waited behind him in line for the machine, I examined his legs in the baggy shorts, hitched up high with a belt. It struck me that I had never seen his legs or any quite like them before: they were thin, purple and potholed; dark nets of vein and large, shapeless liver spots peppered their surface. I thought to myself that those looked to be the oldest legs in the world. And as he left the room, I noticed he shuffled less spryly than he did the day I met him. He looked to be the oldest man in the world. I remember that day because it was the last time I ever saw Dr. Odum. A couple of days later, I heard that a friend had found him in his garden. He had been working and had fallen. He died gardening on a sunny Saturday, a month before his 90th birthday. After his death, a friend of mine in Athens made little Eugene P. Odum buttons, about the size of a quarter: a photo of Dr. Odum's grinning face, with the earth from space behind him. They are kitschy - a little silly - but not disrespectful in my opinion, so I wear mine from time to time. The button goes generally unnoticed, but sometimes people ask who the old man with the world is, and I tell them, "He was a scientist." If I'm in the mood, I tell them he was the Father of Modern Ecology. People respond with a nod of reverent, almost embarrassed recognition, as though they had known Eugene Odum all along, but had temporarily forgotten. Because of Eugene Odum, we are all born with the word ecology on our tongues.